I’m not going to debate if you should choose PVS or MCS, there’s a use case for both of them but with the introduction of Shared Hosted Desktops (SHD) on MCS the use case for MCS got a little bit bigger. A master image will contain the base image (eg the Operating System, Applications and settings), all reads will come from the master image. All writes to the disk will be redirected to the Differencing disk, this disk can be either a persistent or a non-persistent disk depending on the type of deployment you’re doing. When using pooled desktops the XenDesktop Delivery Controller will create a non-persistent Differencing disk so all information on the disk will be wiped when the VM is rebooted. This process will make sure that the VM is reverted to it’s original state and original look and feel. An Identity disk will always be persistent, it’s a fairly small (<20MB) and it’s used to store the data containing the identity of the VM (eg Computer Name and the Computer Account password). Citrix Personal vDisk (PvD) can be added from the Desktop Delivery controller and ti can store both user installed applications, user data and settings. Ok, we’ve got the disks covered. Now what? Shared Datastores: Shared storage isn’t a commodity in desktop virtualisation projects as often the need of IO is higher than the existing NAS/SAN can deliver. Local Datastores: You’d have to configure each datastore first before you can enable the Desktop Delivery controller to copy your master image to the local datastore. In larger environments this will be a painful manual task and after that the master image still have to be copied which can take up some time. The same goes for updating the master image, painful manual task (manual task = risk error) and time consuming. Does it solve the issue with MCS and data locality? 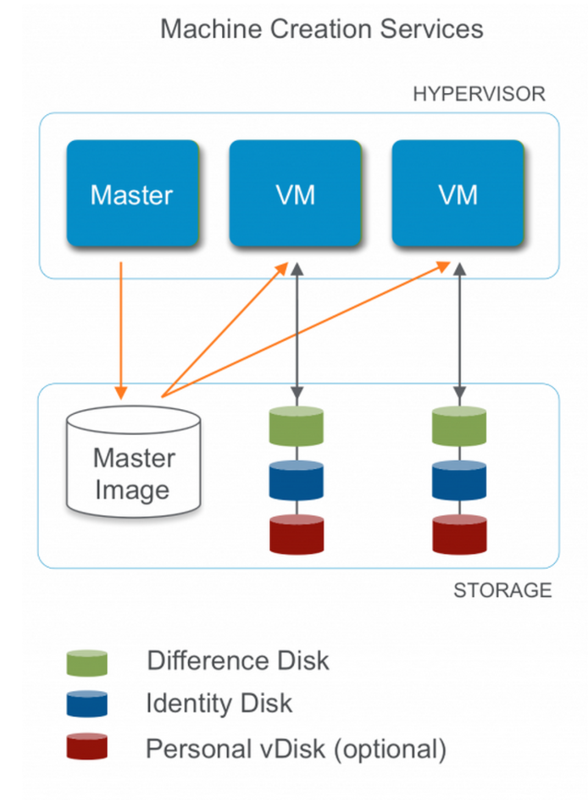 By using the NDFS we can use the advantages of shared datastores as you only have to select your Nutanix Container from your host connection and Nutanix will take care of the distribution of the master image while still having the best performance available because the reads will come from a local copy of the image. Hold on, what is that thing called Shadow Clones? NDFS has a feature called Shadow Clones, it will enable us to do distributed caching of vDisks or VM data which is in a multi-reader scenario. This would be the case when the master image is used, all reads come from the master image and all writes will go to the differencing disk. With Shadow Clones, NDFS will monitor vDisk access trends similar to what it does for data locality. However in the case there are requests occurring from more than two remote CVMs (as well as the local CVM), and all of the requests are read I/O, the vDisk will be marked as immutable. Once the disk has been marked as immutable the vDisk can then be cached locally by each CVM making read requests to it (aka Shadow Clones of the base vDisk). This will allow VMs on each node to read the Base VM’s vDisk locally. In the case of VDI, this means the replica disk can be cached by each node and all read requests for the base will be served locally. NOTE: The data will only be migrated on a read as to not flood the network and allow for efficient cache utilization. In the case where the Base VM is modified the Shadow Clones will be dropped and the process will start over. With the data locality of NDFS and the feature Shadow Clones (by default enabled on NOS 4.0.2 and up or you can enable it manually by running the following NCLI command: ncli cluster edit-params enable-shadow-clones=<true/false>) we can take away the pain of having to configure multiple datastores and solve the time consuming process of copying the master image and updates over all datastores and by using data locality through NDFS and Shadow Clones speed up your deployments.